Create elegance and luxury without sacrificing space with this classic oval whirlpool bathtub. Relax in comfort with its curved lumbar backrest and let the fully adjustable double back and four side body jets massage your cares away. Soak up to your chin in its 18-inch depth and bathe without feeling confined in its extra wide 38-inch span, all the while accommodating a tight space with its 56-inch length. Its curved shape and inward sloping deck create a designer look compared to rectangular tubs with flat decks. The streamlined design is not only elegant but also allows for easy cleaning. Rigid PVC tubing provides 100% drainage of the lines, so water can remain pure and hygienic. 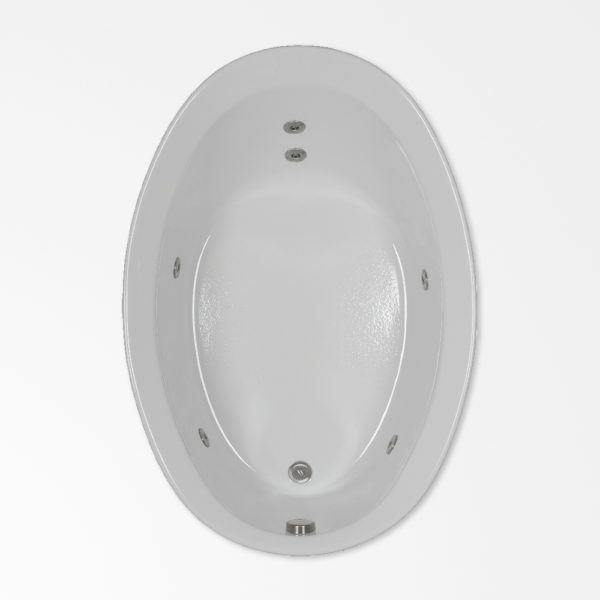 A galvanized steel base supports the tub and ensures long-lasting quality. Enjoy all the benefits of hydrotherapy and classic design in your small space with this oval tub. Absolutely the best tub I have ever had. I would not hesitate to buy another one.. The comfortflo team was an absolute joy to do business and very knowledgeable.. The best thing about comfortflo was when you call these folks get a person not a recording!!!!!!! !